The main problem with the modern smartphone (and so many of our small, handheld electronics) is that the battery life on these devices is usually quite short. In fact, it can be difficult to go for more than a day or two before your battery eventually dies. This is why small, portable backup batteries like the Smart Solar Bank from GearBest.com have become so popular in recent years. The fact that this USB-powered battery comes with a built-in solar panel, a tiny LED flashlight, and costs only $13.82 USD only adds to the reasons you should add a backup battery to your arsenal of personal electronics. As you can see by looking at the photos on this page, the front size of the Smart Solar Bank is covered in a small solar cell (the size of which I am not sure). Leave the Smart Solar Bank out in the sun for a period of time, and it will eventually charge up the Lithium-Ion battery inside the device. That’s right! You can charge up this small, portable USB battery by plugging it into your computer or wall charger… or you can charge it up by leaving it out in the sun for a lengthy period of time. I doubt that many people will be able to use this product solely based on the power it produces from its tiny solar panel, but the fact that the Solar Bank comes with a tiny solar panel built into does work to separate this USB-powered backup battery from so many of its competitors currently on the market. Most users, I imagine, will grow tired of waiting for the battery to get its power from the sun and will opt instead to charge the battery with a USB cable plugged into their computer or wall charger. While solar power sounds great, I also wonder how having the solar panel built into the battery will ultimately affect the life and functionality of the battery inside. After all, solar panels left in the sun can get extremely hot, and we all know that electronic devices such as Lithium-Ion batteries should not be kept in super hot locations. My guess is that the solar panel on the Smart Solar Bank isn’t really meant to be used as its main power source. Instead, the solar panel should be seen as a supplement to charging the internal battery with a USB cable. When the Smart Solar Bank is charging (whether from the sun or from the included USB cable), there is a series of four small lights on the back of the battery that light up and flash to indicate 1) that the battery is charging and 2) how full the battery is charged. The image above shows all four small purple lights – which indicates that this battery is now fully charged. At the top of the Smart Solar Bank there is one small USB input port (which is used to charge up the Solar Bank from your computer or wall charger via the included USB cable) and two standard USB out ports (which can be used to power or recharge two small electronic devices). For example, you could use the Smart Solar Bank to charge your smartphone and GoPro video camera at the same time. Overall, this is a cheap little backup battery that has some nice features built in. 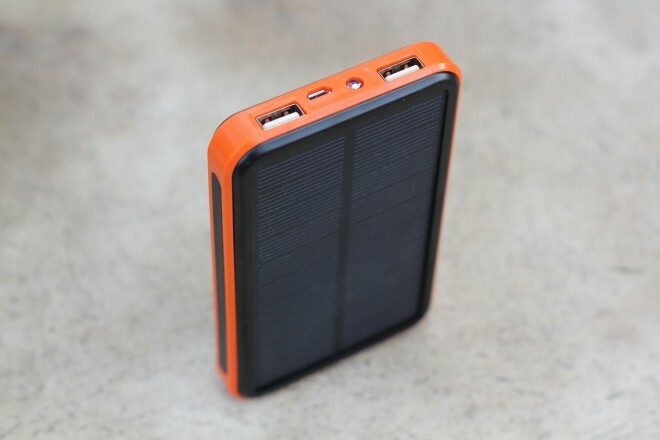 The battery is lightweight, comes with a built-in solar panel and an emergency flashlight and costs only $13.82 USD (at the time of this review). It’s not the largest or most powerful USB-chargeable backup battery, but it’s the perfect size for someone who needs to get one quick charge from their smartphone or other small electronic device. It would be great to carry in your purse or backpack and could even be used on weekend bike touring trips. 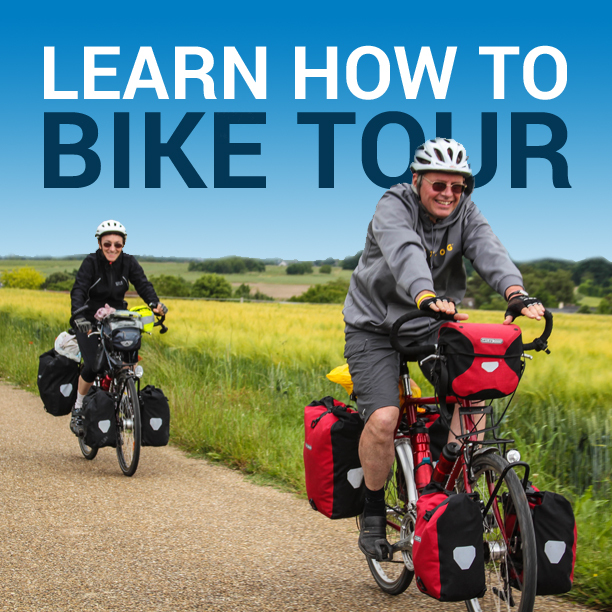 Please note: This product was sent to Bicycle Touring Pro for the purpose of this review. This entry was posted in Bicycle Touring Pro Articles, Electronics, Main Articles, Product & Service Reviews, Products, Tech and tagged backup battery, batteries, battery, bicycle solar power, smart solar bank, smartphone power charger, solar powered backup battery, solar smartphone charger, usb batteries, usb battery, usb powered battery.